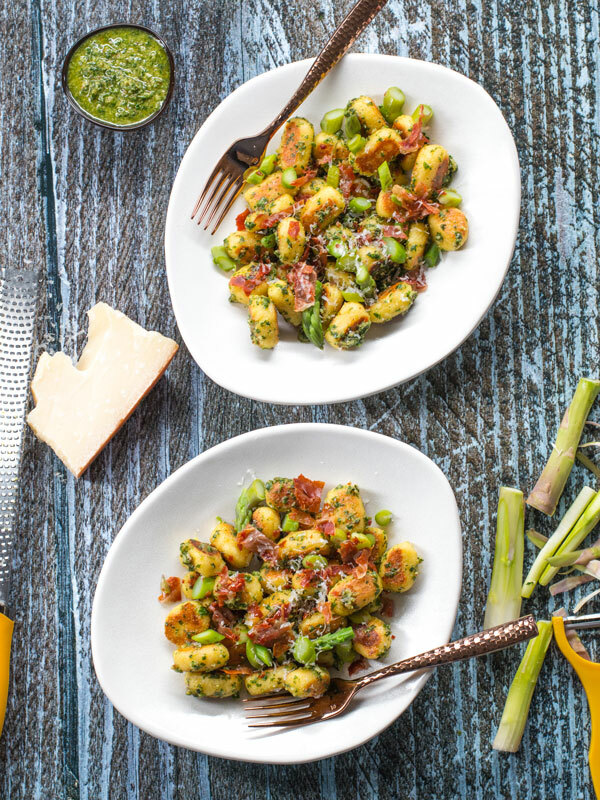 This low carb keto recipe features homemade gnocchi that are light and crispy, tossed in a herby and cheesy pesto sauce. 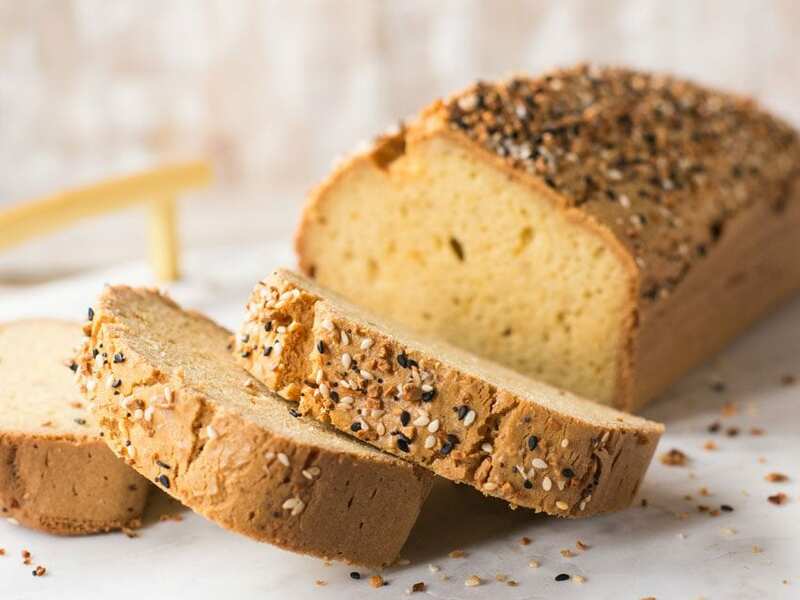 If you have been digging our low carb recipes lately, like Dessi’s keto dessert biscotti and her now famous keto bread, then you are going to love this recipe for low carb gnocchi. Make sure to exactly follow the instructions below. These gnocchi are delicious and incredibly similar to the real thing, but they are very temperamental! First you need to mix the dough thoroughly using a pastry cutter preferably, and then you need to rest the pasta dough for 20 minutes so the almond flour can get hydrated. Think about this for one second. 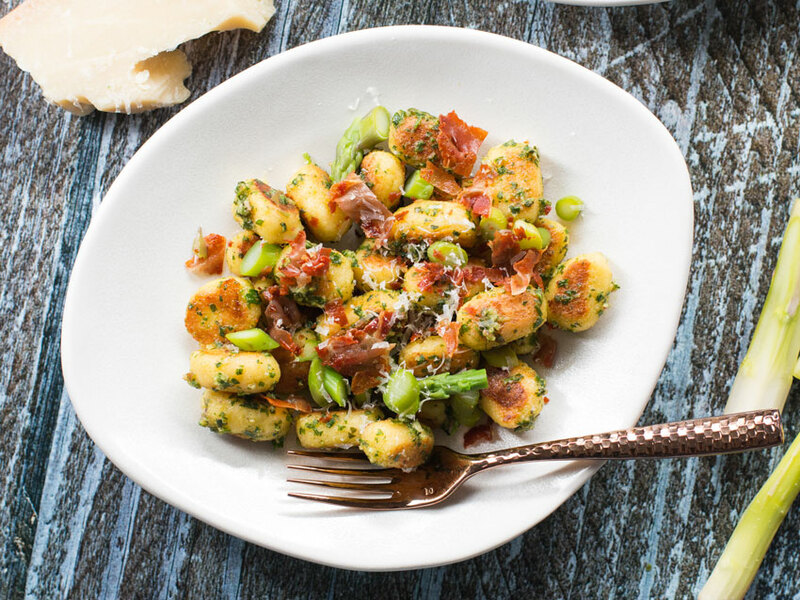 This keto recipe for gnocchi has no starch or gluten. 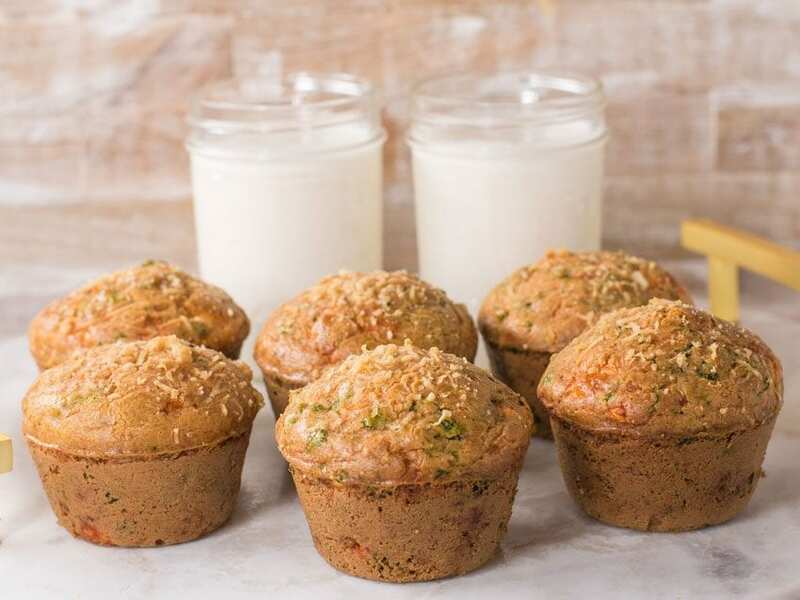 They are merely held together by almond flour, eggs, and mozzarella cheese, so it’s only by Dessi’s magic touch that this recipe actually works! Now I have recipes for low carb pastas using shirataki noodles, like this ramen soup, which by the way is perfect for the fall, and my low carb pesto pasta. keto recipe for homemade gnocchi and pesto sauce. To cook these gnocchi, bring a pot of water to a bare simmer. If you drop these gnocchi in boiling water, they will fall apart. The water has to be a bare simmer and you must only boil these low carb gems for 30 seconds. Oh, and you have to work in batches. If you drop all the gnocchi pasta in the water at one time, they will get mushy and stick together once they are pan seared after. I know, this recipe is a bit of a pain in the…but trust me, it is so worth it! Once the low carb gnocchi have cooked for 30 seconds, you transfer them to a hot non-stick pan to get nice a crusty on the outside. The crispy edges with creamy soft interior make this keto pasta recipe over the top, and I am telling you, they taste almost like the real thing! All you need for a tasty pesto sauce recipe is some fresh herbs like parsley and basil, any kind of nuts, and a food processor. Just pulse the herbs, nuts, garlic, lemon, and slowly add some really good extra virgin olive oil while the machine is running. Once the pesto looks well blended and the consistency is loose, add some grated Parmesan cheese, mix one more time, and you are done. For some really good extra virgin olive oil, check out the fresh pressed olive oil club and use my promo link to get one bottle for $1 – no strings attached! This low carb pasta recipe for homemade gnocchi is the closest thing to the real deal, plus it's keto diet approved. 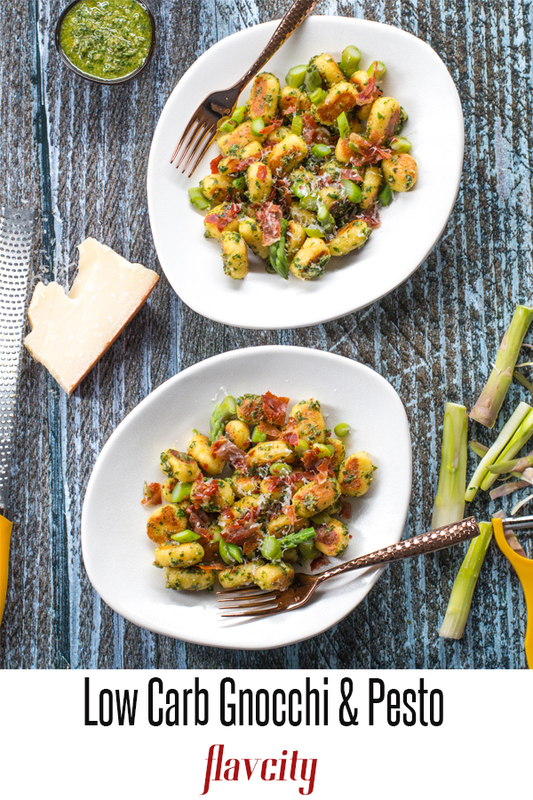 Toss this gnocchi in a herby pesto sauce and you will be eating the best low carb pasta of your life. For the gnocchi, beat the eggs in a large bowl and then add the salt, baking powder, and mix well. Add the finely grated cheese, mix well with a spatula. Add the almond flour and mix well. Continue to mix the dough for 1-2 minutes using your hands, spatula, or pastry cutter(like in the video). It’s important to mix well so the cheese and almond flour get fully incorporated. Let the dough rest for 20 minutes at room temperature in a bowl. Cut the dough into 4 pieces, add a little almond flour to a plastic cutting board or on your countertop, and roll each piece of dough into a long sausage shape, you can cut the dough into two pieces if that makes it easier. 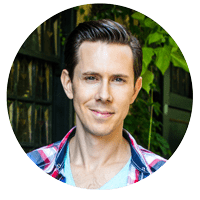 Watch the video in this post to see how we do it. You want the dough to be about ¾ inch thick. Use a knife to cut the dough into roughly ½ inch gnocchi pieces and then roll each one tightly and form into a gnocchi(football) shape. Repeat with remaining dough and place formed gnocchi on a platter and in the freezer for 15-20 minutes. After that, you can place them in a freezer bag and freeze for 2 months. Gnocchi must be frozen when cooked in boiling water. Meanwhile, make the pesto by adding the pecans and all the remaining ingredients except the cheese and olive oil, to a food processor and blend until everything is well combined, about 10-15 seconds. With the machine running, slowly add the olive oil and process until combined and very smooth. Add the cheese and process another 10 seconds. Turn the machine off and taste the pesto, it might need more cheese or lemon juice. If the consistency is a little dry, add 2-4 tablespoons more of oil while the machine is running. Make the crispy prosciutto by pre-heating a large non-stick pan(will use that pan for gnocchi later), just above medium heat. Add the sliced prosciutto and cook until crispy on both sides, about 5-6 minutes total. Remove and set aside. 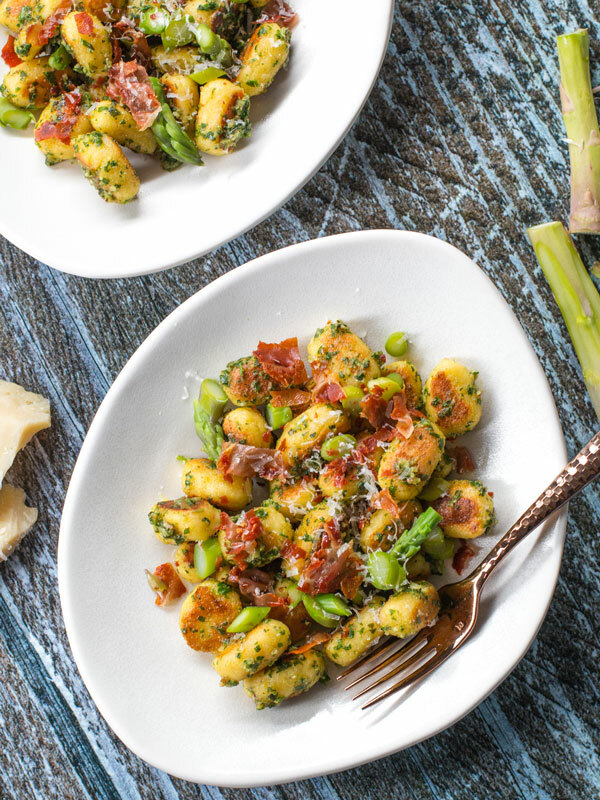 Bring a large pot of water to boil for the gnocchi and asparagus. Cut the bottom end of the asparagus off, season the boiling water with 2 teaspoons of salt, and cook the asparagus for exactly one minute. Remove, but don’t drain the water, and run under ice cold water for 30 seconds, set aside. FOLLOW THESE INSTRUCTIONS EXACTLY. Don’t boil all the gnocchi at once, you need to work in 4 batches to make sure they cook evenly and don’t get smashed. Make sure the water is NOT BOILING, it should be at a bare simmer, otherwise the gnocchi could fall apart. Pre-heat the same pan used to cook the prosciutto over medium-high heat with 2 teaspoons of oil. Place a strainer in the water if you have it, add ¼ of the gnocchi. Cook for exactly 30 seconds, drain, and place in the hot pan and carefully cook for 1-2 minutes until nicely golden on both sides. Transfer gnocchi to a plate and repeat that process with the remaining gnocchi. I know it’s a pain, but these gnocchi are very fragile and fickle. Once all the gnocchi are cooked, I find it best to return them to the pan over low heat and add as much of the pesto as desired, and toss to coat for 30 seconds, or until warmed through and coated nicely. 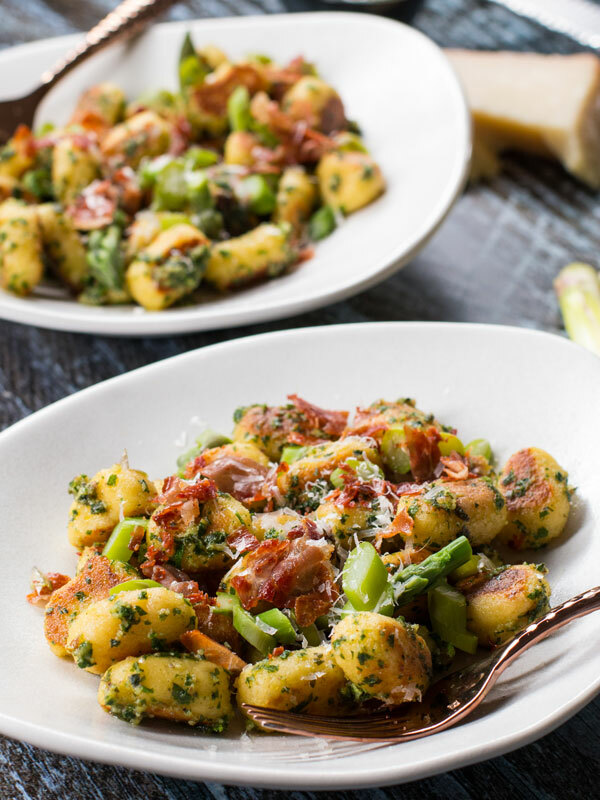 Serve gnocchi with sliced asparagus and crumble crispy prosciutto on top, enjoy! Gnocchi will keep in the fridge for 3 days or can be frozen for 2 months. The best way to reheat is in a hot pan with more pesto or if using microwave, cover container with a wet paper towel and make sure not to overheat. this is one of the best dishes I have ever made. Well worth the effort!! Followed directions and perfect the first time. First recipe I’ve made twice on here. I also used the gnocchi “dough” recipe to make a fairly decent Keto friendly pizza. I am Italian and made gnochi with my great auntoften, when I was a little girl, it’s afairly involved process, including rolling out thedough (which was 2 pounds of boiled potatoes, 2 eggs, and enouh flour to make it all hold together, she added it a handful at a time, until it “felt” right(a lot ofauthentic Italian cooking is like that) so I don’t know exactly how much. but probably a pound or so), then the dough is then rolled out thin and flat and cut into 1 inch squares each square which was then rolled over the back of a fork so it rolled into a tube shape, a tricky move I had to relearn every time I made them : ) this seems so much easier!, and brought back some wonderful memories of great long afternoons spent with her, she knew they were my favorite, so she made it a point to pass the knowledge on to me, thank goodness!, I just wish I could find the time to make them now! i wish i had an Italian nonna to make pasta with! I don’t like pecans. What other nuts can I use. Thanks so much. Hi Lisa, you can replace the pecans in the pesto sauce with walnuts, peanuts, or pine nuts. Hi! I am notnsure what happened but my pasta still came apart during the few secs they were in the simmering water. What do you think about skipping the boil and going straight to the skillet? Even though mine ended up partially mush, the flavor was all there and I plan to bake the mush so all isnt lost. Hi Ross, it’s a very delicate recipe…It probably happened because the gnocchi were not frozen, or water was boiling, instead of below simmer. Go ahead an try skipping the simmering part and let me know how that turns out.. This was amazing. 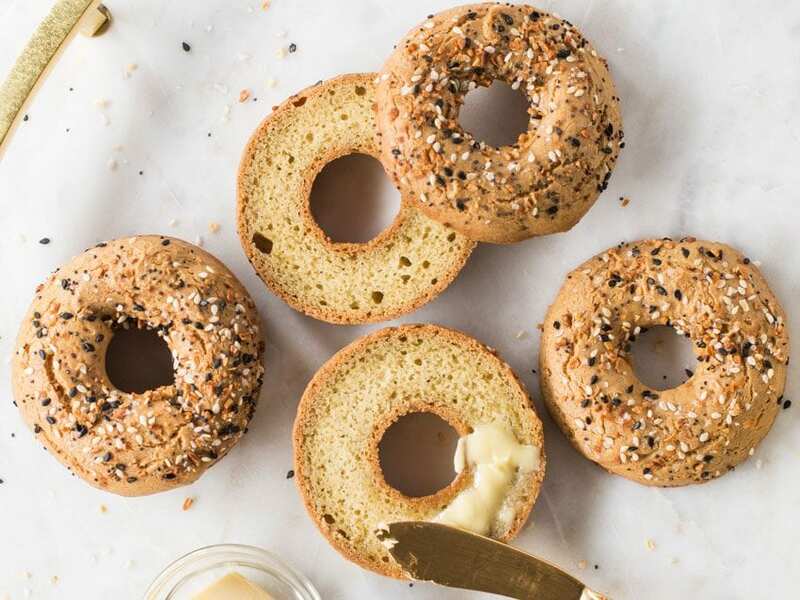 We are slowly working through your recipes and this is one of the best Keto recipes ever. Our only regret was not doing a bigger batch of gnocchi so we could freeze some! Awesome. Alexis, so glad to hear it!!! Good job! Hi, I cannot print out your recipes? I have tried both on Chrome and Internet Explorer, neither worked. When I click the ‘Print’ button, all it does is open up another web tab. I click that print button again and it opens up another tab. Hmmm….I just tried it on Safari and on Firefox and it worked fine on both. Doing so DID open a new tab, but it was a printer-friendly new tab so then all I’d need to do is go to File>Print. I’m very confused. In the video, Dessi says to use “2oz” of finely grated mozza, while the recipe above says “6 oz'” I didn’t catch the discrepancy until I shredded 6 oz of cheese and added it to the 2 egg mixture only to be disappointed that my mixture turned out to be wet mozzarella rather than anything resembling a dough. I will triple the other ingredients now, but since you say this recipe is so fragile, I hope it will not ruin the recipe causing me to waste ingredients. BTW, I love your other recipes and have tried many so far. 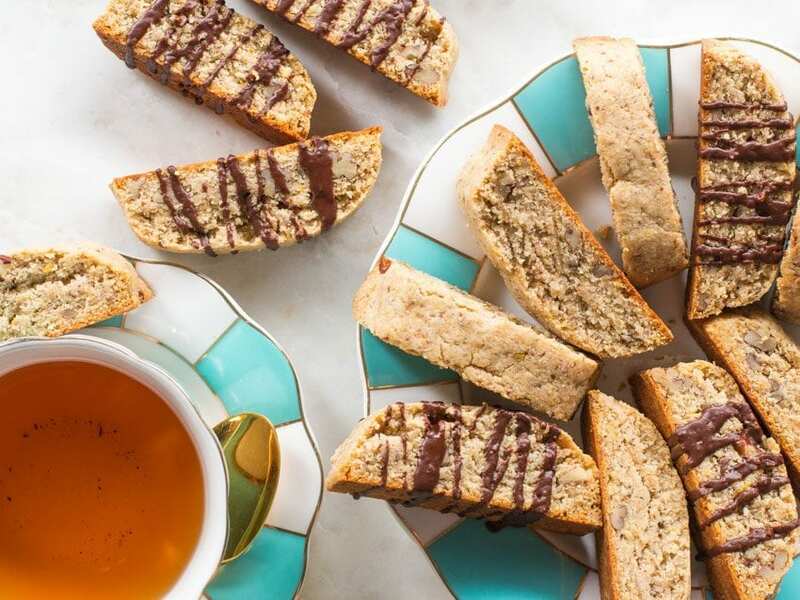 Love the Keto biscotti! Sorry for the goof: 6oz weighed (about 2 cups) is the correct amount. The typed recipe is always the one to go off of. Glad you are loving the other recipes! Hello! What are the micros for just the gnocchi without the sause or extras? The “recipe notes” section of that article page has the macros. Is this what you’re looking for?